Earlier this year, Dufferin Concrete was recruited by MWI Silo Systems Inc. to participate in the building of a large diameter grain silo for one of their customers, Dietrich Commodities, located near Lucan, Ontario. MWI has been in the business of building concrete silos for a wide variety of products as well as other types of specialty towers since the 1960s. 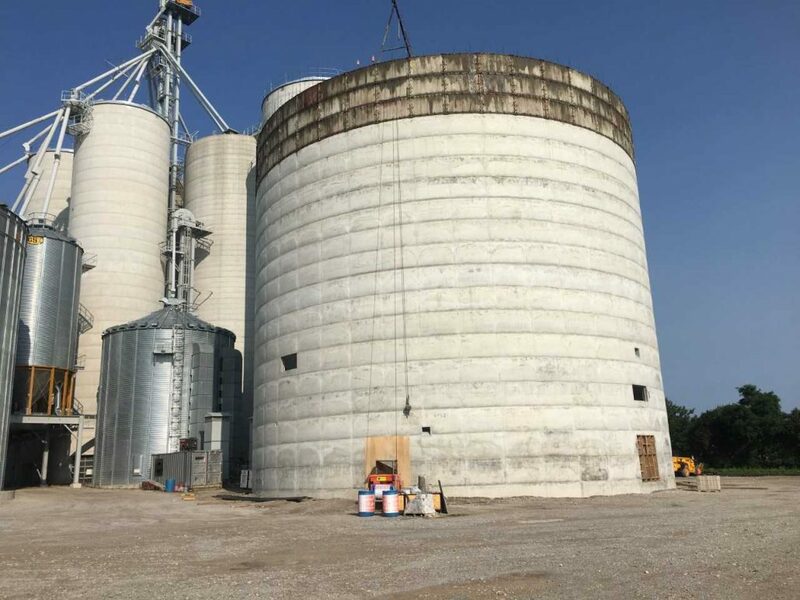 MWI uses a Weaver Silo jump form system to build silos that can vary from 20 feet to 100 feet in diameter. 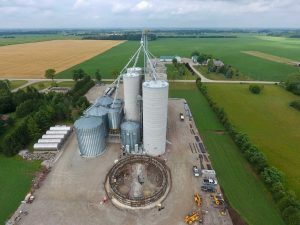 The new Dietrich family farm grain silo is an impressive 86 feet in interior diameter and 132 feet in height, the largest silo ever built by MWI. 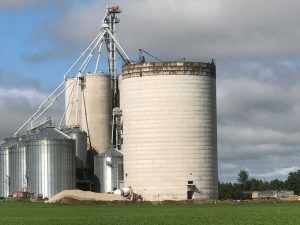 The silo walls are 10 inches thick and made of concrete, which is where Dufferin Concrete came in. 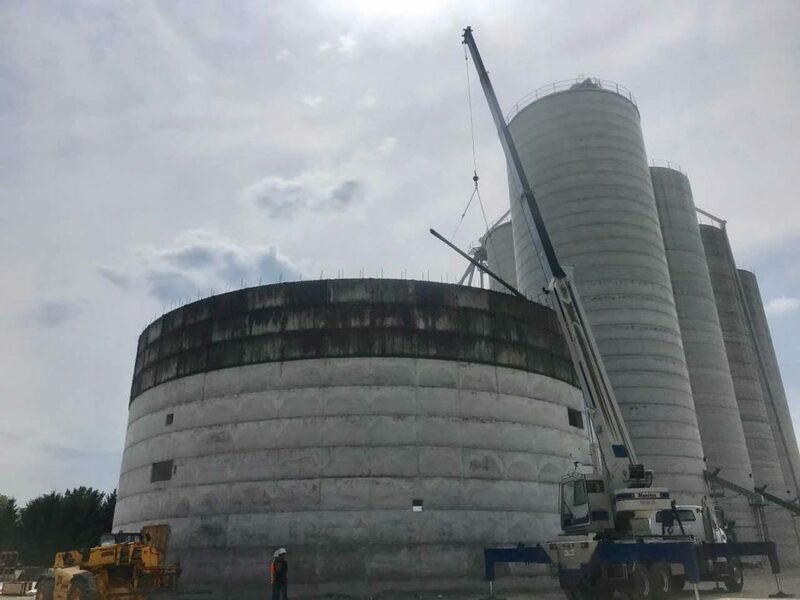 Dufferin Concrete supplied concrete for 1,500 metres of wall, or the equivalent of 29 cubic metres per four-foot lift. This amounts to about 1400 cubic meters of concrete. The time-sensitive project occurred over a 3-month period, with work progressing at about four feet per day, reflecting the large amounts of concrete and reinforcement bar required (over 250 tonnes!). 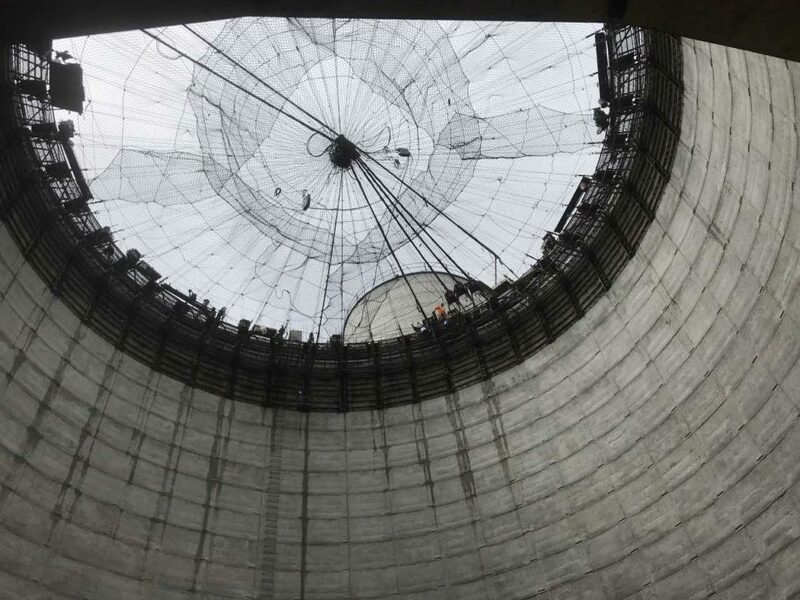 Rebar was placed using a 30-tonne boom truck and all of the wall concrete was placed with the help of two concrete hoists and distributor carts up top. The result is an imposing silo with a concrete floor, concrete walls and a concrete ceiling that can hold up to 14,000 tons of corn or dry grain. This is the equivalent of 600,000 bushels or the average yield of 3,000 acres of planted corn. 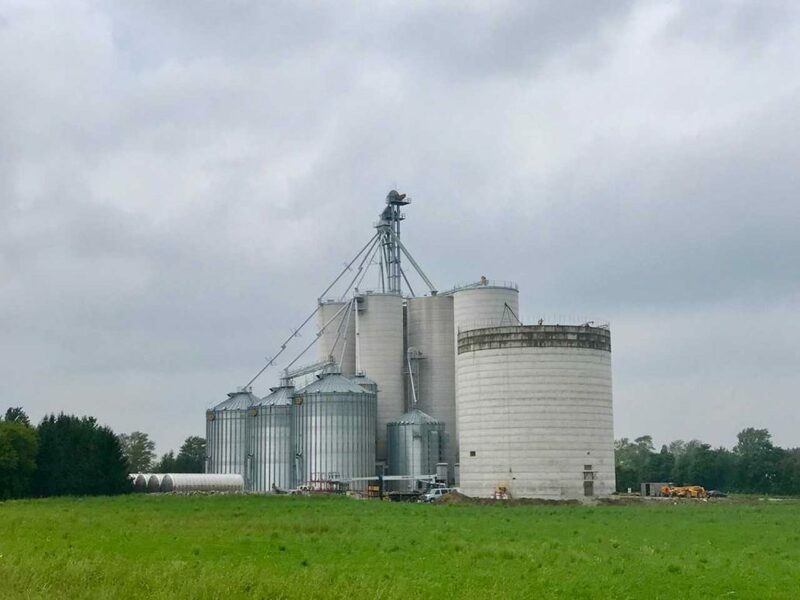 The grain, which has begun to be stored in the silo since October, is loaded into the silo via an elevator and belt conveyor that dumps it into three openings across the top of the roof. It will be sold throughout the year and shipped to ports or feed mills by truck. The silo has three exterior side draw truck load outs, capable of loading a tractor trailer in a matter of minutes. Dufferin Concrete was proud contribute to the completion of this major agricultural project, and help MWI build their biggest silo project ever.